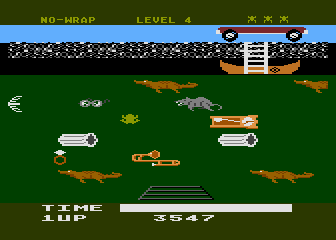 This prototype is a one level concept demo featuring the never before seen sewer level of Frogger II. One can easily see how this level eventually became the underwater level from the final game, as they share many of the same properties. This one screen demo is fully playable, but contains no sound or music. There aren't any selectable game levels or options other than the Wrap/No Wrap feature which is toggled by the Option key. 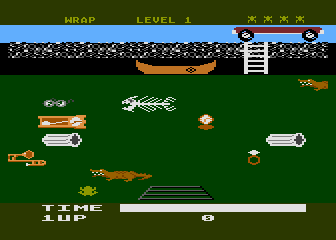 However this feature is not implemented yet, and Frogger simply stops when he reaches the side of the screen. 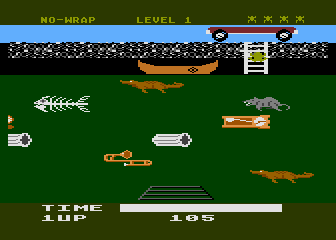 In this sewer level, instead of dodging deadly fish and crocodiles, Frogger must avoid sewer gators, fish skeletons, grandfather clocks, trombones, and many other odd things that don't seem to make much sense (this was a test level after all). 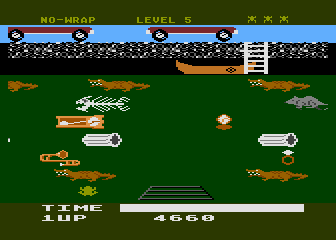 Once Frogger makes it to the top of the screen he can either jump in the canoe to go the next highest difficulty level (it tops out at six), or climb the ladder. 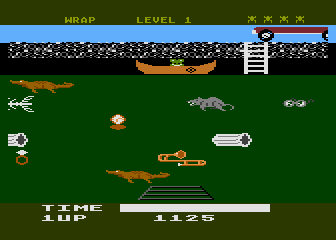 In the final version climbing the ladder would have taken frogger to the next screen (presumably a road themed screen), but in this prototype it just resets the game. Another interesting feature of this prototype is that Frogger appears to sink downward as well as drift to the side. This makes it even harder to reach the top as you cannot simple stay in one lane for very long or you will sink down into an enemy. One can see why this was taken out, as it makes the game a bit too hard. 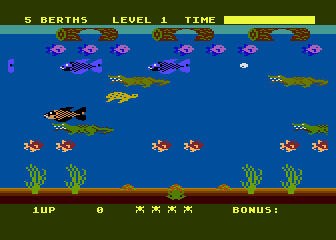 Also note that the grate at the bottom of the screen is deadly, much like Larry the eel in the final game. Why are there trombones and diamond rings in a sewer? Climb up the ladder to froggy freedom!